The Calypsonian had just concluded what would be his last interview on Power 102’s “With Men in Mind” hosted by Norma Clarke. Eyewitnesses said the calypsonian was still conscious but in great pain as several of his fellow bards surrounded him and tried to render assistance. 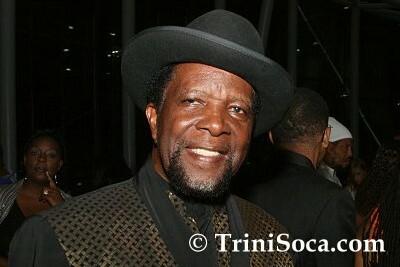 Among them was Sugar Aloes, who held the critically wounded calypsonian as he lay on the ground, and Arts and Multiculturalism Minister Winston “Gypsy” Peters. Conquie was still alive when an EMS ambulance arrive on the scene to transport him to hospital but died sometime later. It’s always sad when someone “passes” Almost three weeks ago halfway around the world while in the shower “yuh so old and stompy,yuh never have money…….” The manner in which he left.Condolences to the bereaved family….God bless! Knowed him personally, a real gentleman I am toataly shocked my deepest sympathy to his family. Conky may you rest in peace. Very sad. We never know when we will leave this world. Condolences to his bereaved family and to the kaiso fraternity. There were two calypsonians that I remember Bob Gittens played regualarly as I was getting dressed to leave for school — The Hawk and Conqueror. The Hawk died last year and now Conky this year. May their souls rest in peace. a gentleman within the Kaiso fraternity. May he rest in peace. Perhaps a pedestrian crossing named in his honour, at the site would be a fitting memorial. You will be conquie, Dolly I have you in prayer. Will be miss,you was good and man and a good person to everyone. I’t always a sad day when a public figure leaves this world, it is doubly sad when it is in these circumstances. May his soul rest in peace. Arts and Multiculturalism Minister Winston “Gypsy” Peters, calypso icons, family and friends of the late Leroy Paul, known popularly as the Mighty Conqueror, were moved to tears during the bard’s funeral held yesterday at the Church of the Nazarene in St James. There were as many people on the road as inside the Church of the Nazarene, St James, for the funeral service of veteran calypsonian, Conqueror (Leroy Paul), yesterday. From his humble beginnings, singing calypso under the lime tree at Belle Vue, Dundonald Hill, Leroy Paul, fondly known as Conqueror/Conky, rose to national and international prominence.